I’m always looking for new side dishes to serve with dinners. I’m pretty creative and adventurous when it comes to the entree, but for the accompaniments, I tend to fall back on making the same (delicious but not terribly exciting) side dishes over + over again. My husband loves sweet potato fries, and frequently orders them at restaurants, so I decided to try making a healthier, non-fried version myself at home. And I’m so glad I did, because they turned out SO good! They’re delightfully crisp (+ insanely addictive), with a wonderful sweet-salty-spicy flavor. And they’re super simple to make – you simply peel + chop your sweet potato into fry-shaped pieces, toss with some cornstarch and your desired seasonings, then bake them until they reach that perfectly crispy texture. Since they’re baked, not fried, you don’t have to feel guilty about indulging in them. Fearless Baby absolutely loved them, and since they’re packed with good-for-you calcium, vitamin A and vitamin C, I didn’t have to hold her back in enjoying them. =) I can’t wait for y’all to give these a try soon – I have a feeling that you’re going to love them as much as we do! Preheat the oven to 425 degrees Fahrenheit. Peel the sweet potatoes and cut them into slim french fry-shaped pieces (about 1/2″ wide). Try to cut them into similarly sized pieces so the fries will bake evenly. Put the uncooked fries into a large ziplock bag. Sprinkle with the cornstarch, close up the bag, + shake until all fries are coated evenly. Open up the bag, and add in the olive oil and all seasonings. Seal it up and shake again until all fries are coated evenly and there are no powdery spots. Pour the fries directly onto a non-stick baking sheet for best results (do NOT line with parchment paper or tin foil – that results in a less crispy result). Arrange your fries in a single layer and do NOT overcrowd, otherwise they will not crisp up. If needed, spread them out over 2 different baking sheets. Bake for 15 minutes, then flip the fries so they can cook on all sides. I find the easiest way to flip them is with a metal spatula. Section by section, scoop up about ten fries and flip them with a quick turn of the wrist. Bake for 10 to 15 more minutes, or until the fries are crispy. You’ll know they’re done when the surface of the fries change from shiny orange to a more matte, puffed up texture. It’s essential to bake them long enough, otherwise they won’t be crispy. Don’t worry if the edges are a little bit brown; they will taste caramelized, not burnt. I love making sweet potato fries! They are our go-to side dish for turkey burgers. Yours look wonderful! oh wow amy, these look fantastic! i make sweet potato fries all the time but usually cut them larger. love the thin fries! Love the seasoning on these Amy. I’ve succumbed to using semolina flour whenever you want to guarantee a crispy finish. I can’t recommend having a bag in your cupboard enough. Oh, what a great trip, David! Will have to pick up a bag – thank you! I am such a sucker for sweet potatoes – especially sweet potato fries. Yours look so crispy and perfect Love that they are baked too and totally wishing I had a batch for dinner! We love baked sweet potato fries – my husband is always SO happy to see me working on them for dinner! Yours look perfect! 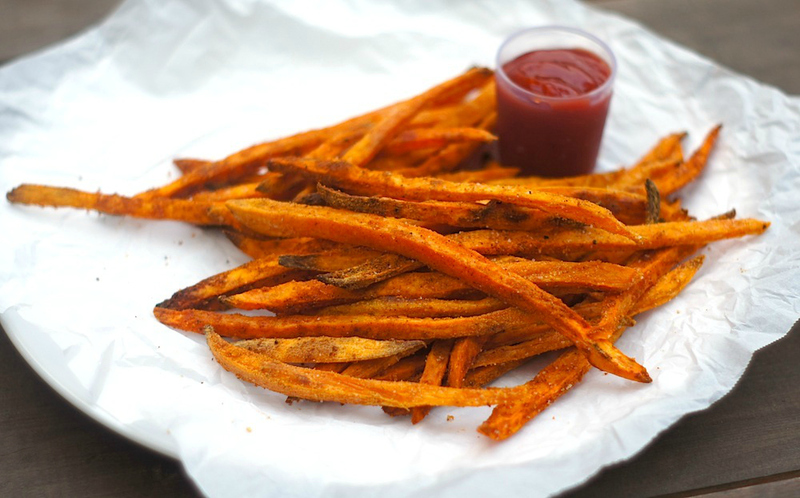 We love sweet potato fries! These look delicious and I love the cayenne on them. Oh I will have to try cornstarch! I have tried soaking them in cold water and then patting dry but they still don’t get crisp enough for me in the oven. One of my favorite sides. I switched it up this weekend and made butternut squash fries. 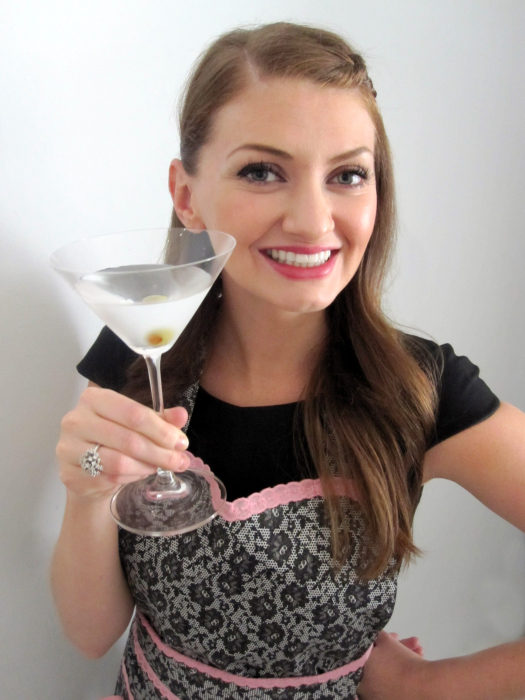 I remember you mentioning that to me when I first made these a few months ago – SUCH a smart idea, Danielle! oh yum! you can’t go wrong with these! I’ve been making something similiar to these for a while. Def has become a go=to dinner pick in my house. Looks great! So delicious! I’ve made baked sweet potato fries before, but I love your choice of seasonings. Wonderful! It is SO hard to make the perfect fries! I’ll have to pin this recipe though! I could munch on a bag full of those. Baked is always better than fried so I am all up for it. oh… They look extremely crispy! I love this recipe! I LOOOOVE sweet potato fries! I need to make these! Those look delicious! I’ve made them at home as well, but I think I need to cut them thinner like yours so they become crispy. Mine were a little on the mushy side. I wouldn’t mind some of these right now!